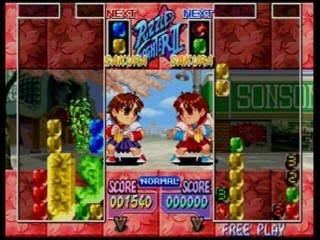 The official name of this game is "Super Puzzle Fighter II Turbo." 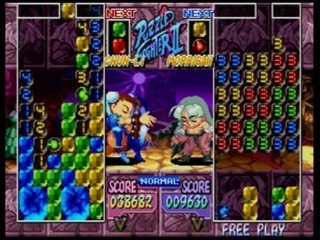 Since it is so long, everybody called it "Super Puzzle Fighter" or "Puzzle Fighter." It is hard to understand what this game is about until you play it or watch it for few minutes. Then you realize how addictive it is: You build large gems with the little gems that fall from the top, and then destroy the large gems with the circles that fall from time to time. 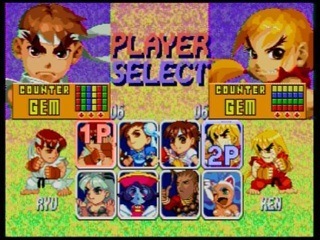 The game features characters from Street Fighter II and Darkstalkers. 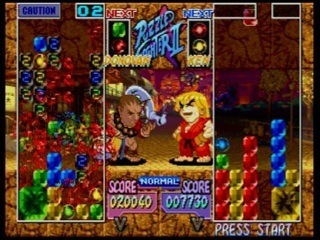 It was made soon after Street Fighter Alpha, based upon some of the backgrounds.